I’ve unexpectedly found myself with a couple of weeks of leisure time in London in the middle of January. I could have gone somewhere, but actually…and this is the big secret…London is a great place to hang out it when you’ve got time off. Sure, the weather isn’t guaranteed, but that doesn’t matter – you’ve got cafés and restaurants galore, and more culture than you can shake a large stick at. I love in particular that so many of the galleries are free, so you can pop in and consume culture in bite-sized chunks. Now, I realise that sounds terrible gauche, but in saying that, I mean you can see a few pieces at a time when your mind is fresh and clear, and really enjoy them. When you’re starting to flag, just step out side and do something else. Our great galleries contain some superb works, and really, seeing them should not be a chore. Hence – bite-sized chunks! Yesterday I got a call from my friend Kristine to meet up. She proposed Chelsea, late breakfast and some art. The sun was shining and the morning air clear and crisp. A perfect day out. The venue was Tom’s Kitchen, her suggestion and somewhere that is apparently well-know for its breakfasts, especially the American favourites of pancakes and French toast. I was due at 11:15, but of course I was not on time. Stoke Newington to Chelsea is not quick at the best of times. Then factor in the randomness of London’s transport network, a seemingly endless wait in the tunnel (which was probably a minute but felt longer) and helping a couple of people with prams, and of course I ran late. So when I emerged above ground I called ahead and asked her to order me some pancakes. Rushing through the streets of Chelsea, I felt rather happy that I’ve dressed smartly for the day. People probably think I’m going somewhere important to do important things. Of course, the reality was more mundane, just that I didn’t want to arrive to cold pancakes. Depending on what matters, I suppose that is rather important. Still, I enjoyed my little mystery dash down Onslow Square and the very picturesque Pond Place. I arrived, hot and flustered, and settled down. The place is lovely – all white tiles and wooden tables, and while it clearly gets busy at weekends and for lunch or dinner, if you get there during the morning of afternoon lull, it’s really quite peaceful. My pancakes were on the way, but we decided that as it was approaching lunchtime, we would order a little more. My timing was bang on – breakfast runs until 11:45, and I had about two minutes to spare. 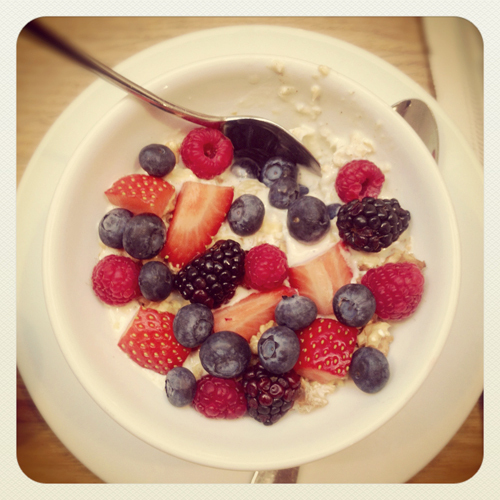 Kristine opted for the Bircher Muesli with fresh berries, and I ordered the beans on wholemeal toast with cheese. The beans – they are very, eh, ‘huge’. The waitress told us this while at the same time gesturing with her arms that we could expect something rather massive. She was clearly aware that the pancakes plus the beans would be a challenge, and that’s always a piece of advice I’m happy to receive. Suggests they are thinking about you. But, I was hungry, and after this mammoth late breakfast, we were up for a long walk in the fresh air then some culture, so fortification was needed. The beans came, and they were indeed huge. Lots of toast, lots of baked beans, lots of cheese on top. This was marching food in terms of portion size, so I have to credit our server for giving due warning about the volume of food we had ordered. They were fantastic. Lots of bread, loads of beans, and a lovely great big generous topping of melting cheese. Having stepped inside from the chilly streets of Chelsea, this was all very welcome. After making short work of those beans, it was pancake time. I’d had in my head that I would be tucking in to a pile of many small pancakes, artfully arranged in a stack. It wasn’t like that. 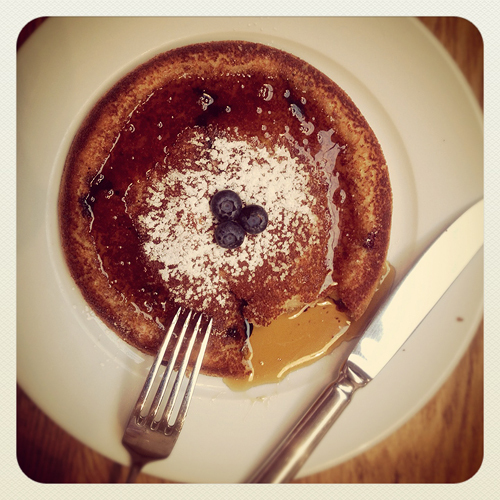 Instead, it was one thick pancake, with lots of blueberries hidden underneath. I mean lots. I can’t stand when you get only a few pieces of fruit in a dish that has the name of that fruit in the title. So today – I was very happy! The thicker, slightly spongy pancake reminded me of the German Kaiserschmarrn. A serious pancake, to provide a solid foundation for later. I probably drowned the poor thing in too much maple syrup, but it happily soaked the stuff up. A sweet, sticky, messy, fruity treat. Delicious! Our lunch consumed (for we finished late, and well past midday, so it was getting a little silly to pretend it was still breakfast), we had a little wander through the side streets of Chelsea. 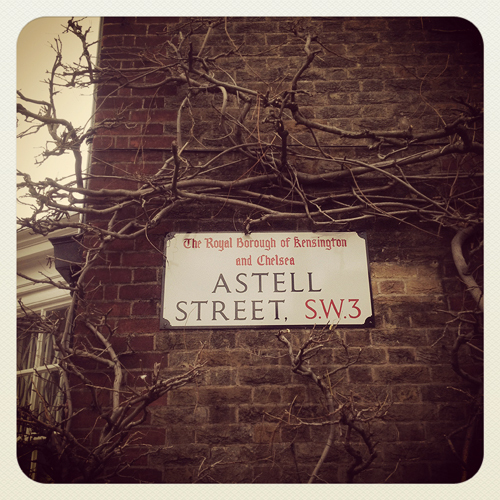 Now, how posh are the street signs, enveloped in wisteria? We also took in the culture at the Saatchi Gallery just off the King’s Road. All in all, this confirmed that I really am really rather good at enjoying having time off. So…would I go back? Definitely. Tom’s Kitchen offers some very good food and a relaxed atmosphere. Simple as that, and a great way to set yourself up during the week for sightseeing or shopping in and around Chelsea and South Kensington. But as we left, it was getting seriously busy with the lunch crowd, so booking ahead is probably no bad thing! 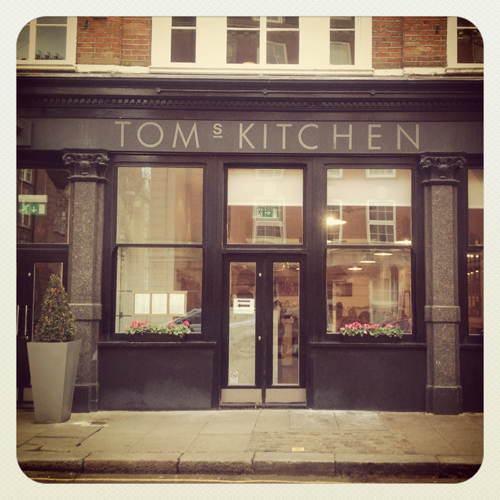 Tom’s Kitchen, 27 Cale Street, London SW3 3QP. Tel: 0207 349 0202. Tube: Sloane Square or South Kensington. PS…you might also notice that the pictures today are a little different – yes, this is all thanks to Instagram. Now, you may wonder why I am doing this when I am also the proud owner of a DSLR camera? Well, there are a couple of reasons. Firstly, whipping out the bad boy at the dining table is cumbersome and I think really annoying for other diners. Click, click, flash, click. I think it’s annoying, and thus don’t do it to others. The iPhone is far more discrete (well, OK in a cafe or when eating somewhere informal…I think I’ll be keeping it firmly in my pocket when it come to fine dining experiences). Plus – I like the “Polaroid” effect on these shots too, simple as that. If you’ve got a view on the subject – do share!